HI there again and welcome to the second page of my favorite hobby! Sorry to say that the first page took forever to load so I have done some creative reconstruction and here is the result. I hope you like it and with that I am back in business again ..
First off there is a ton of information out there about all facets of shortwave radio and this server only allows so much webspace so if any ideas are thought of please email me to suggest them!! Update on ANARC SWL net Now as of April 25 until further notice there will not be a ANARC SWLNET on 7240 khz on Sunday mornings at 10 am.Don't blame me :) According to Dave Kirby the net operator there was some discussion about how the net operates as it was related to amatuer radio and the decision was made to put it on standby until possibly September or October due to low turnout:( Yep that means now no net to listen to on Sunday mornings. The good news is the ANRC SWLnet page is still up and you can go thru the archives of past nets and see who has been hearing what. :) You will find a few in there from me as well as a bunch of other dedicated SWL'ers. Sorry to be the bearer of bad news but that wasn't my decision folks. However the IRC #swl chatroom is still up and running on any StarChat server.Also look for #ODXA which is run by the Ontario DX Association as well. Look below for links on the IRC thingy and how you can join us. Now in 2017, the solar cycle is about at rock bottom and as a result not many dx targets are audible..However South Americans are audible still on 60 meter band and the 31 meter band at night up until around 0500..sometimes later. The Pacific area is audible at times in early morning and late at night..African stations are hard to hear now but can be heard in late afternoon. With that out of the way take a look through the page I put together here for some more pics and links to some of the sites I have found over the past few months. The Realistic DX380 for an am mode only shortwave radio is not a bad deal for someone just starting out.Also found under a Sangean name of ats808a.. This radio can be found for under 100 dollars at most places. It works well for general shortwave listening and as an added bonus you get TWO bandwidth filters .Definitely not usual to see that feature in a radio of this price class.. If you can find one pick it up and try it out . All in all a good little performer.Passport to World band Radio rated this at one time as a good buy and recommended for weak reception areas so that is how I found out about it .Specifications were taken from owners manual and I have no actual electrical info for it at this time but it does real well at my nightstand for general listening. TIP Some people have complained recently about this radio not being very sensitive. Here is a tip and if you are proficient in soldering small parts try this out.Credit goes to Mr.Marco Ciocca for clueing me in on this. If radio appears to be weak or even dead on the am broadcast band (520-1710 khz) and or the shortwave bands replace the Q3 FET transistor with a MPF102 from Radio Shack.RS part number #276-2062 for 99 cents. This drastically improved the reception of my DX380 to the point to where I now need to use the local\dx switch to cut back the signal getting in . Please note the original fet was a 2sk291Q which I don't know if that was the MPF102 equivalent or not.But boy it sure made a big difference in my receive. Thanks to Mr.Ciocca for the help. The RadioShack twin known as the Realistic DX440 is also still found although the differences are that the DX440 hasn't got the recorder din plug jack and also did not come with ac adapter or antenna adapter.. However this is the finest radio I have ever found for the $100 range and the performance can't be beat in this price class of portables.. I have heard stations from all over the globe from the powerhouse BBC to RTM Sarawak from Malaysia on the tropical bands using just a 21 ft vertical in the trees. Can tune the shortwave bands in 12 subbands with one button. Frequency readout to 1 khz. That is about all I could get from the somewhat screwed up Radio Shack service manual which is the same thing as Sangean model with only slight differences.There are a few modifications that can help this radio out even more and they can be found at some sites I have listed below. Passport to World band Radio rated this for several years as their choice for a portable radio in the under $300 range and they didn't lie :) Very good value and some can still be found refurbished at Universal radio although they are becoming more rare .Last seen at a price of $140 there awhile back. Also to get around the analog dial readout I wired a RadioShack frequency counter up to the radio so I can tell what frequency I am on.It's not a bad deal if you can find one but don't pay anything over $60 or so for it. The am broadcast band is it's strongest point with shortwave being a little tricky due to the single bandwidth.Beware though with it's being such an old design the air variable tuning does tend to drift quite a bit till it is warmed up.It's still not a bad radio overall. I definitely have seen worse. Some Shortwave Radio Terminology These are some more common terms you will hear when hearing about shortwave radios in general .I put these here because some of you may not know what they mean or what they are. GMT or UTC-Greenwich Mean Time or Universal Coordinated Time-What the major broadcasters go by time wise.1500 GMT would be for the people on Eastern Standard Time 10 am in the morning.In summer during Daylight Savings Time that would be 11 am. AVC or AGC-Automatic gain control-regulates automatically the signal input to your radio's audio section so you don't get a blast of sound if the signal suddenly increases. BFO-A beat frequency oscillator-What you use to tune into SSB signals with. IF Filters- intermediate frequency filters-A electronic component in the radio that limits the bandwidth of your radio so you don't hear 30 stations from different frequencies at the same time.Commonly seen as term of 5 khz filter or 2.4 khz filter. Commonly used bandwidths are 6 khz and 2.4 khz.All shortwave Broadcasters are in bands which are given to them in 5 khz increments.Thus a 10 khz filter is going to let in a lot of audio from an adjacent station 5 khz up from where you are tuned to. 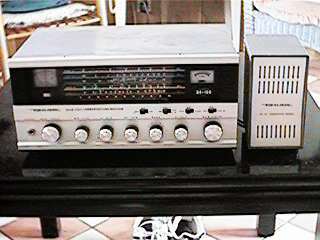 KHZ-a smaller measurement of frequency called kilohertz or in the old days was called kilocycles.You know you have an older radio when the IF filter switchs are labeled as 2 kc or 4 kc.1 khz = 1000 hertz. Meter-European way of measuring the shortwave bands such as 5975 khz would be in the 49 meter band.The term is used to describe the actual electrical length of a transmitted signal in meters. SSB-SingleSideband-A mode of transmitting with reduced carrier or no carrier.Hams and utility stations use this quite often as it saves on bandwidth and can be heard somewhat farther than normal am mode.There are 2 kinds of SSB -Upper sideband USB - and Lower sideband LSB. SWBC -Shortwave broadcast- used in terms of SWBC bands or International shortwave broadcasters as in VOA. CW- continous wave-What is called Morse code.Used by hams and utility stations such as ships at sea. Mode-type of transmission-can be am,ssb,cw,fax,rtty or fm. These are just a few of the terms used in day to day shortwave radio stuff.For a more complete SW dictionary I suggest the Passport to World Band Radio book or the PWBR as we call it. A great place to find updated broadcast schedules compatible with OpenOffice or MS Office. WANT TO KNOW HOW TO GET YOUR OWN SHORTWAVE RADIO NOW? TRUCK ON OVER TO PAGE 3 OF MY SHORTWAVE SITE USING THE TONKA TRUCK BELOW .